MELBOURNE midfielder Tomas Bugg says he cringes every time he watches vision of himself pushing injured Tiger Jack Riewoldt in Sunday night's game at the MCG. Bugg, 23, felt compelled to express his regret for his part in the incident, having accepted that he crossed the line in the Demons' 33-point win over Richmond. The Match Review Panel handed Bugg a $1000 fine for making contact with an injured player after vision surfaced of him pushing a clearly distressed Riewoldt while he was in the hands of trainers early in the final term. "When I watch back now, I'm definitely remorseful," Bugg told AFL.com.au. "It actually makes me cringe when I watch the footage. At the time I didn't really think of the consequences and what would come from it." 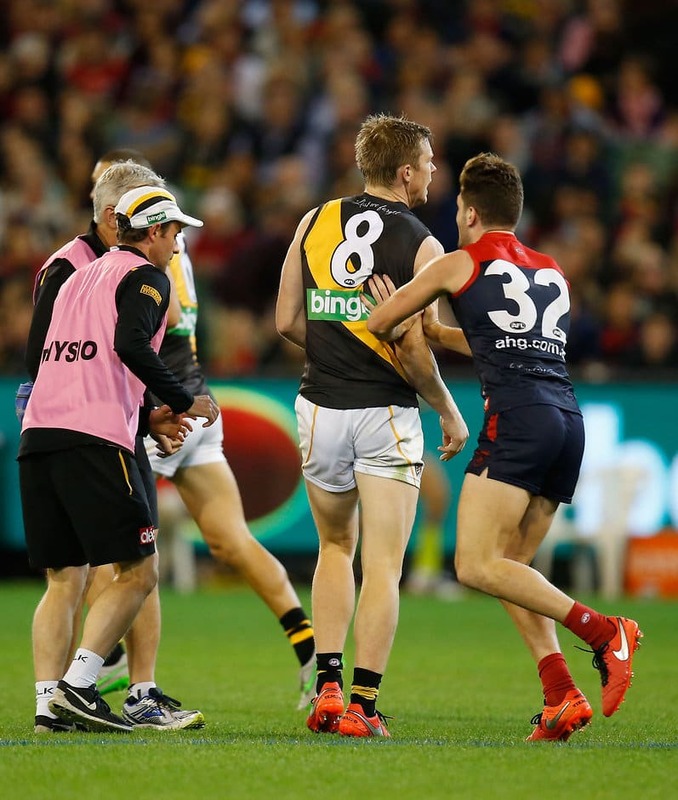 Bugg texted Riewoldt after the match to apologise for the way he had conducted himself and the tough onballer conceded he allowed himself to get caught up in the heat of the moment. "It (the MRP sanction) was probably a valid punishment. It's totally against the rules and going forward it should be treated exactly the same way," Bugg said. "You shouldn't be allowed to make contact with an injured player because the main priority is trying to prevent injuries in our game." Bugg, who was traded to Melbourne from Greater Western Sydney in last year's player exchange period, was also criticised for 'showboating' by Access All Areas panelists Matthew Lloyd and Damian Barrett on AFL.com.au. As he charged into an open goal midway through the second quarter, with Melbourne leading by four points, the former Giant pointed to the stands to express his jubilation. Bugg then delivered a cheeky 'quiet-down' finger gesture in front of the Richmond cheer squad at the city end, having booted his first goal in red and blue. "That was a bit of character and passion coming out in my game," Bugg said. "Now looking back on it, it seems like I was putting the focus on myself and that doesn't really sit too well with me. "Where the team's gone this year, we've been really team-orientated in our focus and that's what has got us our three wins so far and that's what's put us in a good place for the year to come." Melbourne will be searching for its third win in a row when it takes on St Kilda at Etihad Stadium on Saturday afternoon, a feat it has not achieved since rounds 17-19 of the 2010 season. "We're really building a sustainable and successful team," Bugg said.